With this post we want to formalize the launch of Gooba for Mac, scheduled for this summer. 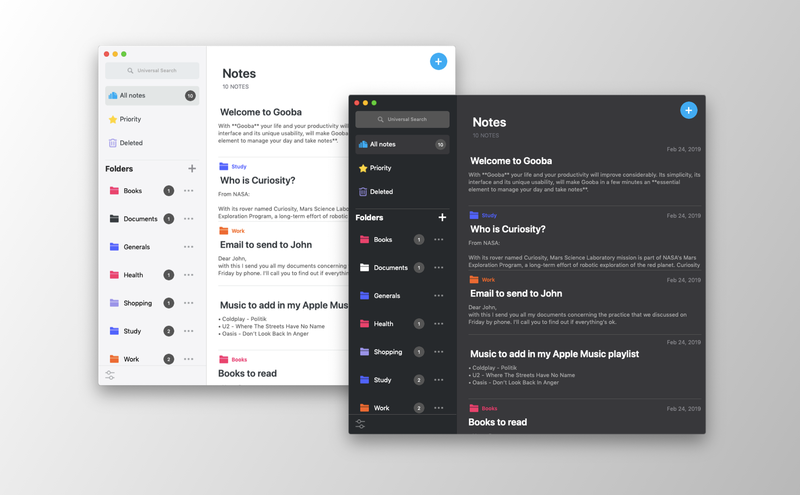 In our social channels, a few weeks ago, we published some previews of the interface of our application for Mac. 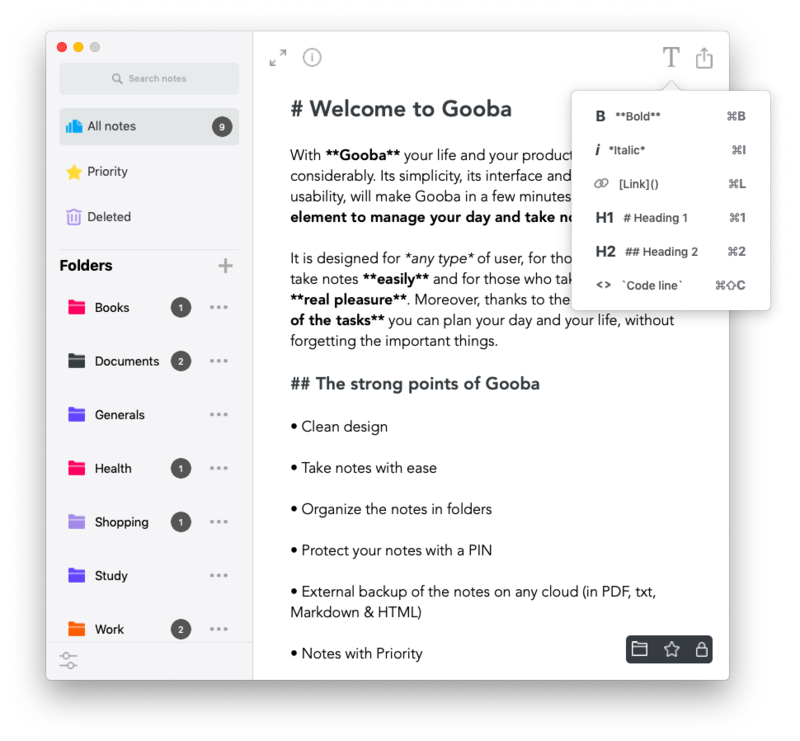 Gooba for Mac will make our service even bigger and more important, making Gooba’s Notes and Tasks universal for the Apple ecosystem. In fact, thanks to the apps for iOS, watchOS and macOS, your notes and tasks will be synchronized simultaneously on your iPhone, iPad, Apple Watch and Mac. Initially only the Notes will be available in the Mac app. Since we are working to make the Tasks even more powerful, this feature will come later. The Mac app interface will adopt the same aspects and principles as our iPhone and iPad apps. In fact, each section is well designed to offer the same user experience. However, we had to re-adapt some aspects to work correctly with the macOS interface and because of the help of the pointer. In addition, we will find the beautiful Gooba Dark Mode. 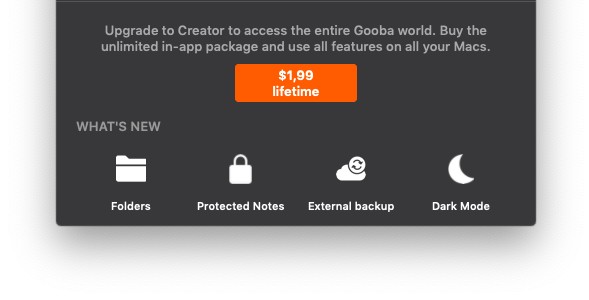 Unfortunately for a lack by Apple, the Gooba Creator plan cannot be universal and therefore shared with the app for iOS and watchOS. For this reason we will create a new plan: Creator on Mac. The Creator on Mac plan allows you to get access to features such as Protected Notes, the organization of notes into folders and backup of the notes. To allow users who have already purchased the Creator plan on iOS, the price of the Creator on Mac plan will be only $1.99 (one-off). Today we have opened registration for the Public Beta of Gooba for Mac. And you can sign up immediately at beta.goobapp.com. Registrations will close as soon as the limit is reached. First beta, according to the established times, should arrive in April. By registering you will receive an email notification with the download link, as soon as we release the beta. To stay updated on Gooba for Mac and the latest news, please follow us on our Twitter and Instagram profile. If, on the other hand, you need help, information, or if you want to report a problem or provide feedback, please visit our dedicated channel.